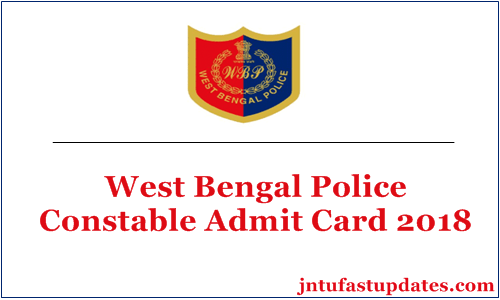 WB Police Constable Admit Card/ Hall Ticket 2018 Download: West Bengal Police Recruitment Board (WBPRB) will release the Police Constable hall ticket/admit card for the written test scheduled to conduct on 23rd September 2018. All the applicants who have applied for the West Bengal Police Constable posts can download the hall ticket/call letter to proceed with the examination. Policewb.gov.in is the West Bengal Police Recruitment Board’s official website. Applicants can get their admit cards by visiting the portal. After downloading the admit card check the details of examination venue, date, and timings of the examination from it. Candidates going to attempt the written test required to download the admit card/call letter/hall ticket as a must to appear for the written test. Hence, candidates can check the further details about the exam dates, hall ticket downloading details, and essential instructions for the written test from the following. The West Bengal Police Department offers various job opportunities for the people having the suitable eligibility criteria. It recruits candidates based on their performance in various rounds such as PET, PST, Written Test, and Medical Test rounds. Candidates clearing all the rounds will be given posting. This year the department has announced 5702 Constable posts for various locations across West Bengal state. The application process was done between 1st April to 30th April. A huge number of aspirants interested to police in the state have applied for the announced posts. The WB police department is going to organize the written test shortly. The applicants required to qualify each round to go to the successive round. Candidates those have applied for the West Bengal Police Constable posts can download WB Police Constable admit card 2018 before 2 weeks of the examination. Candidates can check the details of their examination center, date and time of examination from it. Candidates have to report at the exanimation center before 30 minutes of the examination. Also, carry any of the valid identity proof copy along with the hall ticket while going to the examination. After the verification of the identity of the candidate, he/she will be allowed to attempt the examination. Applicants can also check their details such as name, date of birth, hall ticket number, signature, photograph and other details from it. Do not forget to carry the admit cards to the examination hall. If the hopefuls forgot to carry it and fail to show at the time of verification, they will not be allowed to proceed with the examination. Hence check twice before leaving the examination center. Follow the below give guidelines to download the hall ticket easily. The date of Preliminary Written Test for recruitment to the post of Constable in West Bengal Police has been scheduled on 23.09.2018 (Sunday) from 12:00 Noon to 1 PM. The e-Admit Cards will be available on the website of West Bengal Police (www.policewb.gov.in) from 08.09.2018 on keying of Application Sl. No. & Date of Birth. All efforts will be made to deliver SMS alert to the registered Mobile Number of the candidates. However, the Board will not be responsible for non-delivery of such SMS. The candidates shall have to produce the printout of their e-Admit Cards at the allotted venues for appearing in the said test.